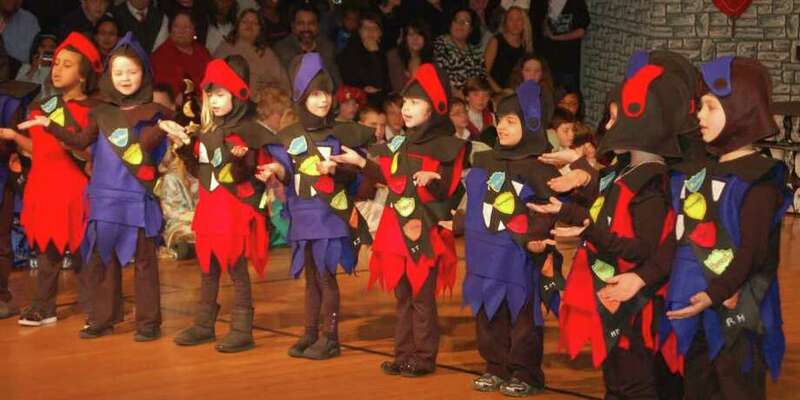 Students of Unquowa School swept their audience back about 1,000 years to the medieval Kingdom of Unquowa for the school's 31st annual Winter Festival on Dec. 15. All 180 students at the private day school -- from pre-kindergarten to eighth grade -- performed in "A Winterfest Carol," an evening of pageantry, song and dance based loosely on Charles Dickens' "A Christmas Carol." Performing amid elaborate sets, the characters included royalty, jesters, wizards and knights. In addition to the students' families, the festival annually draws alumni who performed in previous festivals, and Thursday evening was no exception, the school said. Although set in the middle ages, the Kingdom of Unquowa featured music from various periods -- from Brahms to Leonard Bernstein to Earth, Wind and Fire and the rapper Travie McCoy. While a new script is written by the faculty each year, the school said, the story line annually is always set in the Kingdom of Unquowa . This year's-plot followed a selfish princess as she is visited by the Ghosts of Winterfest Past, Present and Future, who helped her to see the true meaning of giving at the Winterfest celebration. In addition to vocals such as "Be Our Guest" and "You're a Shining Star," musical performances included student string, chimes and guitar ensembles accompanied by a visiting harpist, the school said in a news release. As the performance progressed, the princess saw the error of her selfish ways, declared that this year's Winterfest would be a joyful celebration for everyone and the kingdom celebrated with the whole school chorus singing "We Go Together". Following an Unquowa tradition, alumni who were present joined students and faculty in a weaving circle to dance and sing "The Lord of the Dance." To end the evening, the students sang "Oh Hanukkah" while dancing the hora, and then joined in acting out and singing "The Twelve Days of Christmas."